Footnotes; Glossary; General bibliography; Glossary bibliography. The author has found three reasons to analyze a chart in terms of health. In the first instance, the medical astrologer is asked to give a health reading - to judge the chart in terms of health. The medical astrologer can indicate the client's natural immunities, possible disease indicators, weak points in the body & nutritional deficiencies. In the second instance the medical astrologer may be called upon to interpret the chart of a person with a serious illness or health disorder so as to furnish extra information to aid in determining severity & duration of the condition. In the third instance the medical astrologer may be asked to determine what astrological indicators are shown - using natal chart techniques and predictive techniques - to explain an illness that traditional medicine has been unable to diagnose or cure. This book is a step-by-step approach of procedures to use in assesing health. 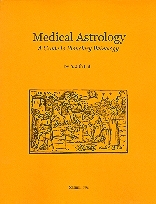 By following a specified format each time a medical reading is done, one will be able to learn the techniques of medical astrology as well as have an organized format of information. This book should be used primarily as a tool in practicing "preventive medicine." Contents: A compilation of astrological terms (physical, emotional & mental) and disease significators used in traditional medical astrology. In the back, four pages of entries for Uranian planets in medical astrology. The bibliography is a useful list of reference books on the subject. 3. In greater depth: Bloodletting, skin and hair, movement and homeopathy, etc. 1. Building, extending, renovating: Correct timing. This book tells how to use the Moon, its signs and its cycles (new, quarters, full, etc.) to be healthy and lead a healthy life. It is almost entirely discursive and, I regret, lacks an index, which would be most helpful. It is a joy to read. The authors are Austrian farmers (a married couple) who have long been in touch with the land, the seasons, and the Moon. They write with first-hand power and conviction. These are the finest definitions of waxing and waning I have ever read, which is an example of the excellence of the book. The authors say you should fast the day of the new moon because that's the easiest day to rid your body of toxins. You should also fast at the full moon, as otherwise you risk picking up things that you will later regret. In this regard, I wonder how many people catch ill in the last days of the waxing moon, and are then ill during the waning phase? Interesting things to think about. Since it was first published in 1995, this book has been a world-wide best-seller. Get it. Read it. Profit from it. Comment: So let's start with Appendix B, How to Use this Book. It says to go to Appendix D, get out the CD-Rom & crank out your very own Wellness Report. That report merely repackages paragraphs in the book, so if you know your chart, there does not seem to be a point to the CD - which I did not evaluate for these notes. In between Appendices B & D is C, Sample Charts. It was brave of Cramer to pick Oprah Winfrey as an example of what the CD-Rom could do. Or maybe she was in a corner. Oprah's reading repeatedly suggests that she forgets to eat, is generally ungrounded & is wracked by nerves. She is possibly epileptic, and is spacey, dreamy & unreliable. (If you're curious, epilepsy has a tightly defined, well-known astrological signature that requires analysis beyond this book or its CD-Rom.) I'm not a big fan of Oprah, but this doesn't sound like one of the richest women on the planet. Cramer is better than this. I can only conclude that this book, intended to be an easy to chew, mass-market best-seller, did not succeed as planned. For someone ungrounded in medical astrology (not to mention your average hypochondriac), this book can be downright misleading. Llewellyn, 215 pages. With CD-Rom (Windows only). 24. Do Planets Aspect Houses? Comment: Casually looking at this book, you would think it would be another rehash of astro-medical basics. It is a lot more than that. There are a lot of details here that I have never seen before, or that are otherwise scattered in many other books. For example, Jupiter as a functional malefic for Gemini & Virgo ascendants (from its debility in these signs, mentioned by V.K. Choudhry), Mars's reflex action in the signs square, opposed & inconjunct to its natal sign position (also from Vedic). She has the best rules for surgery I have yet found, as well as some of the best & most detailed rules for death in a chart. She has a real "what does Pluto do to you" section, free of mythical hype. Much, much more. Based on the author's long experience & observation, even though she's not a doctor (which seems amazing to me). An excellent book. The format is ugly. The spine is along the left-hand side, as usual. The page format is in two colums, side by side. There is absolutely no reason for this, and as the publisher, Schiffer, has not previously produced books in this format, and as there is another recent Lehman title that is the same, I presume the author insisted on it. Let's go chapter by chapter. Chapter 1, The History of Medicine and Astro-Medicine. Topics include, From Prehistory to Mesopotamia, Egypt, Mesopotamia, Greek cultures and the Roman Empire, The humoral system, On the way to the Galenic synthesis, Astrology enters Greek culture, Competing schools of medicine, Botany, Anatomy, Local vs. general: The problem of humoral fluids, Katarchi, Amulets, Galen, Jewish medicine, The Indian connection, China, the Byzantine Empire, Persian and Arabic contributions, The Latin west and the middle ages, Into the early modern period, The new "rational" models, The 17th century, From classical homeopathy to the new empiricism, The mid-19th century, Late 19th - early 20th century, and finally, Endnotes. The chapter is 47 pages and has 244 footnotes. Learn about the value of theoretical systems for the development of medicine. Understand the difference between sacred concepts of disease and empirical ones. Consider ways to evaluate ancient systems of medicine without allowing modern concepts to interfere. Be able to apply the qualities of hot, cold, wet and dry, and observe how their effects inform everyday life, and health matters specifically. Understand and be able to use food preparation and cooking to change the qualities of food. Learn the basic definitions of the four primary temperaments. Understand how the structure of the body can affect the development of disease. Learn how exercise and other components of lifestyle impact the body's exposure to the four qualities. Learn how to treat the body by contraries and similars. Understand Arisotle's doctrine of transformation of elements. Understand how food is transformed into the body itself. Learn the four virtues related to the assimilation of food. Including 87 footnotes, Chapter 2 is 32 pages long, so of course the Learning Objectives are not taught, merely surveyed. It would take several years to learn them. The book is both highly scholastic and academic, as well as endlessly discursive. It reads as if it is a transcription of an oral presentation, where discursions serve the purpose of relieving the tedium. But as a book, there is an inability to cut through the details and arrive at simple, clear statements. Chapter 4 is on diseases. Lehman discusses heart, cancer and drugs, along with suicide. This is rather limited. Lehman stays strictly to her (rather narrow) focus. With Billie Jean King, she notes that Lilly said the chart ruler in the 6th or 12th made for a sickly person, which applies to King. Lehman notes that King was not a sickly person, and then lets it drop. She does the same with Peggy Flemming and Dorothy Hammill, both of which had their Suns in the 9th. Lehman resurrects "joys," which are the houses planets favor. The Sun "joys" in the 9th, which for some reason Lehman equates with actual happiness (pg. 158). Regrettably, I have the Sun in the 9th. The Sun may "joy," but the individual does not. Chapter 5 is on longevity. Which is death. This is a rare topic in any astrology book. Lehman starts out with a simple survey of aphorisms. Saturn in good condition produces death by natural causes but only after a lot of saturnine symptoms. Saturn in poor condition produces an abrupt or violent death, etc., which, again, is not developed. There are bar graphs: The signs of Arabic parts for deaths by heart attacks and cancer. There are a number of tables breaking down heart and cancer deaths by the position of the Moon and Mars, etc., and while there is a lot of variation, the charts did nothing for me. I want concepts, not statistics. The chapter concludes with length of life calculations. Chapter 6, with the fancy name of Iatromancy, is about decumbiture. Iatro- is a fancy Greek prefix that means, "doctor." Ivan Illich popularized iatrogenic, which means, "doctor-induced," which is to say, diseases you get from doctors. Lehman gives a long list of aphorisms. I like Lilly's better. The chapter ends with a number of horary cases. Which, by definition, are not decumbitures. Horary is voluntary. Decumbitures are not. Chapter 7 is on "prediction through time" and is in fact on decumbitures, since the decumbiture chart shows how the disease will progress. Lehman gives examples from Cardan, sets of charts which all have the same name. Lehman then goes on to modern examples, but here she uses transit charts. We have the date of admission to a hospital and then two days later, we have a transit chart for a surgery. So far as I can tell, Lehman muddles the two. She then takes up with disease as shown in a solar return, which is a lot further than I would like to take a return chart. We again have lots of charts with the same title. Anymore my eyes are not that strong and I need a magnifying glass to read the dates under the titles. Chapter 8 is dates for surgery. The writing in this chapter is poor. Do not use these instructions. Get Judith Hill's book (above). If you have the money and it's critical, hire Judith to cast a chart for surgery. She's been doing it for years, she's a pro. Major surgery isn't something you want to mess with. Chapter 9 is on purges (enemas, vomits), diets and habits. Which for some reason starts with medicinal herbs. Lehman has written books on botany. Her work here is poor. How did ancient and medieval people decide what plant cured what? Lehman does not know!!!! Blagrave is vastly better. Quinine is a New World plant, it was found in South America. It was no sooner found than it was immediately identified for its effect on maleria, which was known as ague. Medieval man could do this. Chapter 10 is the conclusion. Lehman thinks the period of Pluto in Capricorn will see the collapse of modern medicine. Which seems likely to me. As a book on medical astrology, the book is weak. As a supplement to better books, this book is of interest and will lead you into many other areas, which will quickly take you beyond this book, which in many ways is limited. At Lehman's website there is currently (March, 2012) a poll asking visitors to vote on what book she should write next. I don't care what book anyone writes, only that they write the book they believe in, heart and soul. Nothing else is worth-while. This entry follows Judith Hill's, above, for a wicked reason: The two women dislike each other. I am not privy to the reason why. Theory: Definition of death; Basic Hindu astrology (a brief survey); Tertiary progressions (a brief survey); Marakas ("killer planets"); Death yogas & longevity indicators; Other factors - odd, new & classic; Rectification via death; Karmic death links; Death escaped. Epilogue; Resource Directory; Hindu Astrology Glossary; Index. Comment: The author's first book. Turned down as unsalable by every publishing house he tried, he eventually published it himself. As he expected, and as it deserved, it created a storm when it first appeared, and not just among astrologers. This book was featured on an NBC Evening News Special & was reviewed in the Johns Hopkins University & Medical Center Newsletter. This book is not for the squeamish, & not for the Jungian-archetype crowd. It is a technical & lively analysis of every type of expected & unexpected death. Without equivocation, it reveals & validates numerous unseen patterns & hidden clues common to over 100 demonstration cases. This Hindu/Western study is for serious astrologers at every level of sophistication. How Hindu dasas indicate death, tertiary progressed angles for exact timing, outer planets that strengthen Hindu methods, completely fatalistic diurnals and MUCH more, using only classic hard aspects & perfect orbs. A brilliant book, repays study. Extensive glossary of Vedic terms. (Looking for Houck's astrological program? He used Mark Pottenger's CCRS program, available from Astrolabe & other specialists.) Houck remarked to me & others that after he passed, his books were not to be reprinted. Get them while stock remains. Comment: On the back cover, we learn the author is the editor of the Astrology & Medicine Newsletter, published by the Astrological Association of Great Britian. She has taught astrology, I presume she has taught medical astrology. This gives her a thorough grounding. This is a teaching textbook. In it, you will learn what all the medical meanings for the planets, signs, houses, triplicities, aspects, positive/negative, midpoints, etc., in a chart. You will learn the traditional rules for decumbiture & electing dates for surgeries, and much more. The book is notably weak in putting the pieces together. Under the Sun, we are given Buddy Holly's chart (September 7, 1936, 3:30 pm LMT (?) Lubbock, TX, pg. 79), with the remark that Buddy Holly was legally blind because of the square between his Sun, at 15 Virgo, and his Moon, at 12 Gemini. She mentions the Sun's conjunction to Neptune & its opposition to Saturn as contributing causes, but the analysis is weak. Carter does her one better, noting that Affliction in the center of mutable signs is very common.... As ascending signs, Gemini, Aquarius and Capricorn probably most often have defective sight. (pg. 164). Buddy Holly had 10 Capricorn rising, Jupiter at 16 Sagittarius square the Sun, Saturn at 19 Pisces in opposition. Carter does this to a lot of people. As a reference, Wanda Sellar's book is quite good. Everything is here, including some very good essays on the history of medical astrology. 1. Facts & fictions; 2. Astrology & medicine; 3. The basics of astrology; 4. New advances in astrology; 5. The control group; 6. Major depression; 7. Anxiety disorders; 8. Schizophrenia; 9. Attention deficit hyperactivity disorder; 10. Addictive disorders; 11. Famous cases; 12. Time, place & karma; 13. The hidden order. Further directions; Bibliography; Appendix A: Conversion chart for planetary placements; Appendix B: Worksheets for modern astrology charts; Appendix C: Declinational chart form; Index. Most of the significant astrological correlations that I have found in the birth charts of clients with mental illnesses have been discovered in the declinations. I will now outline the major terms & definitions that will act as guideposts during our journey into this uncharted territory. Some of these terms were first used by the Magi Society in Astrology Really Works [out of print]. In the square Declinational Chart Form, there are many charts given in this book. However, birth data is given only for Dr. Gibson. The bibliography: Under Astrology (complete list): Ebertin's Astrological Healing; The Complete Book of Fortune, by the Associated Press, 1936; The Astrological Review of Alex Bethor, 1909; Cosmic Influences on Human Behavior, by Michel Gauquelin; Sandy Johnson's Book of Tibetan Elders; Michael Beazley's The Compleat Astrologer; Guttman & Johnson's Mythic Astrology. Under Medical (complete list): Diagnostic & Statistical Manual of Mental Disorders, 4th edition, 1994, by the American Psychiatric Association; Kaplan & Sadock's Comprehensive Textbook of Psychiatry, 1989; Kaplan & Sadock's Handbook of Clinical Psychiatry, 1990; Weiner's Textbook of Child & Adolescent Psychiatry, 1996. Contents: Part 1: Introduction: How to use this book; 1. Tips & hints (food, diet); 2. Detoxifying; 3. Oxygen-giving supplements; 4. The disease cancer. Part 2: 1. The sun afflicted; 2. The moon afflicted; 3. Mercury afflicted; 4. Venus afflicted; 5. Mars afflicted; 6. Jupiter afflicted; 7. Saturn afflicted; 8. Uranus afflicted; 9. Neptune afflicted; 10. Pluto afflicted. Tables: A. Daily dosage, vitamins & minerals, brand name units. If you want to change your diet, read chapter 1. If you want to detoxify (because Neptune is afflicted & poisons have accumulated), read chapter 2. If you are interested in taking oxygen-giving supplements, read chapter 3 (these vitamins & minerals help give me tremendous energy). As a preventative against the disease cancer, I take the vitamins & minerals mentioned in chapter 4 (that, is, if they are needed - and I can handle them - according to the kinesiology test & whether they are afflicted in my horoscope during a specific time).